But unlike other all-too-frequent occurrences in Ocean Beach, the soil underneath didn’t sprout condos. 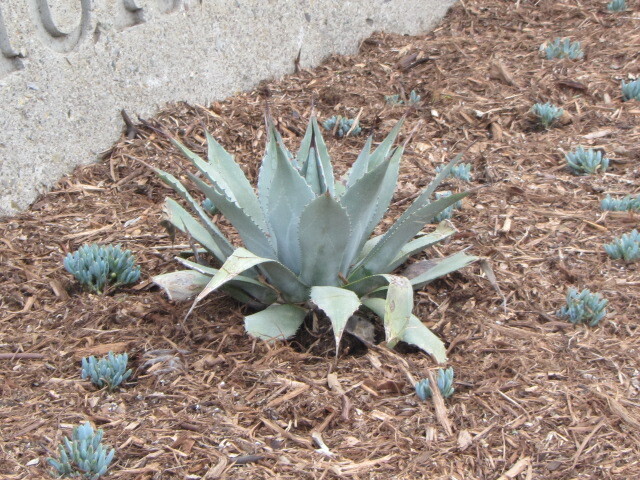 Instead, the native plants that lead to the new church entryway took root, showing every sign of thriving and spreading. As described by the designer, the land has been contoured as dunes that conceptually match the border between the sand and the sea, illustrating the flow of ocean across the sand to the shore. The plantings flow from the low green and then to the taller reeds on the dunes. The native plants are a part of a larger refurbishing at St. Peters which includes a new entryway. There will be new kitchen and bathrooms, and remodeling of the parish hall, but the first thing people will see is the native plant garden that lies between the remaining parking and the building. It fits right into the neighborhood. The plants at the “Hippie House” are right across the street from the church on Adair Street, enabling the Focus Committee at St. Peter’s to have a feel for what things will look like when the plants are in full flower. Sunset Cliffs Natural Park has a demonstration native plant garden soon to be planted at the foot of Adair Street on the cliffs. The theme of the St. Peter’s restoration is “All Are Welcome”. 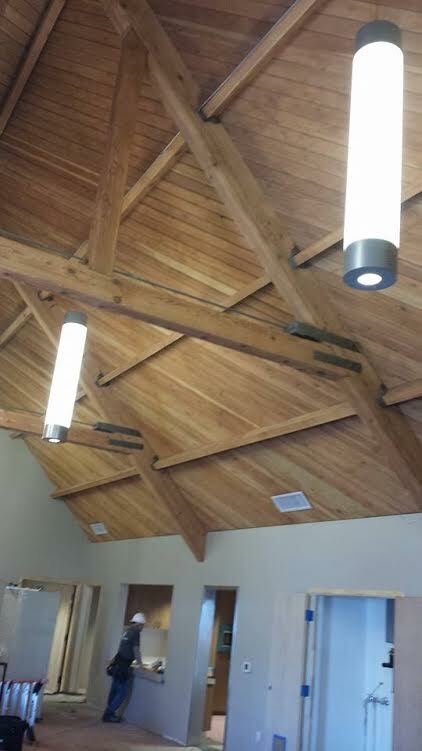 Although the sanctuary was not redone, the original wood beams were returned to a natural wood finish. Access to the buildings are now ADA compliant, with no physical barriers on the church site, and walkways constructed suitable for wheelchairs. There will be an “Open House” a spring Saturday after Easter to welcome the neighborhood and the parishioners to have a chance to look at all the improvements, date not yet announced, as construction has a way of not always being finished on schedule. Having been through two pastors, two architects, and the 2009 economic downturn, the excitement in seeing this come to fruition is easy to understand. 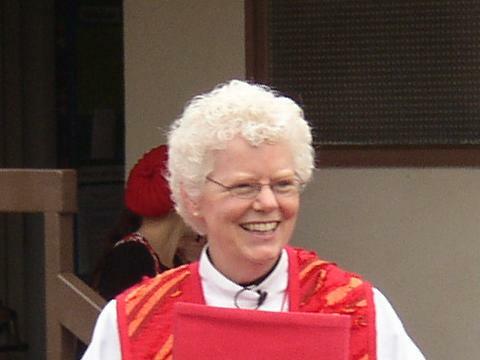 Pastor Karen Marohn, the current pastor, is shepherding the new look to a building that has been there since 1948. The parish hall was completed in 1953, and the educational building in the 1960’s. Although some refurbishment was done in the 1980’s, enhancing the nautical theme, the latest is the first since then to make this 70 year old building new again. Pastor Marohn grew up in South Dakota, with her first calling in South Carolina, and now she is in Southern California, which she declares is as far south in the US as she is likely to get. On a sad note, the chair of the original building committee, Don Snowdon, died during January last month, with the regret that he would not live to see the project complete. His memorial will be the first service when the renovation is complete. And no, I’m not a member of the church. A building project that does not cover every square inch of the available site with multi-story buildings and bay windows overhanging the sidewalk deserves a voice of thanks from the Ocean Beach community and a design award. When our only open spaces are the parking lots that are still above ground, we all should be thankful for what the church has done. Nice article, well done. I do have one question. Where will the churchgoers who used to park in those removed spaces now park? Did the church make some other accommodations on its property or will those people have to park on the street? The church property, I believe all acquired at the 1948 beginnings, has three separate parking lots. They are still truly blessed with ample parking. With all due respect, that may well be but that didn’t answer the question. Did they just reduce the available parking or did they find a way to accommodate the lost spaces elsewhere on their property? Do you know how many spaces they took out of service? We only “lost” three parking spaces with this project. Two of the three lots were sealed and stripped today! Looks great. Geoff, I will have to do some research to answer your question in detail. There are three separate parking lots – one on each side of the church, and additional parking on the other side of the alley. Right now, the construction company has a trailer on one of them. Even with construction, there has been no off-site parking from church goers. Ok, I look forward to hear what you find out. Your last sentence was interesting, I’m curious how you know there “has been no off-site parking from church goers? The title of the article might be a bit misleading. it was just the parameters of the parking lots that were landscaped…almost all of the parking lots remain. But the article has it right! Beautiful landscape design by William Joyce. When Sunset Cliffs Natural Park gets the city permit to do landscaping along the trail, this corner of Sunset Cliffs will indeed be an example of beauty that is sustainable, drought-tolerant and native. Parking is not a big issue in this neighborhood. And church goers probably stay as long as a tourist or surfer and not overnight. I used to go to a vet’s office by the church and parking was always a problem. Right now, the vet’s old place is unoccupied as is the place on the corner of Ebers. If they become businesses, parking will be worse. Geoff, seems like you haven’t been there in a while! I can’t recall ever having an issue. Now might be the time for you to return on a Sunday and see for yourself how it will pan out! Nice article Lois! I had wondered; the Church has done a wonderful job and is to be commended for being interested in spreading goodwill in the local community. Thank you so much for the wonderful comments on the St Peters project. Its Watkins goal and pleasure to build Landmark projects. We take great pride in all of our projects that we build. Like our logo says BUILD TO SERVE. Thank you so much Bill Bagby Superintendent. We live on Adair and are church members of St. Peters By the Sea. The project has been on schedule and so very thoughtfully planned. kudos to the staff , Karen and the planning committee, It is coming along wonderfully. Our family attends St Peters regularly. This update to the building has been very thoughtfully and prayerfully planned. The building will be more accessible for all. We share fellowship after services (my children can’t wait for Sunday to share snacks and fun with their St Peters friends- they are 5 and 2). The update (still in progress) already makes fellowship feel brand new. It is so light and the flow of the space is so inviting. The people at St Peter’s were inspired to create a space that encouraged the outside community to feel welcomed and encouraged to come inside. In our experience we were greeted so warmly our first visit it felt like family from the start. As we shared coffee and snacks my little one (8 weeks old at the time) was treated so kindly and was told that he was welcome in the sanctuary and his little sounds were a blessing. We don’t have any family in San Diego (my husband and I are both from the east coast), when I was in need of bed rest during my second pregnancy, our St Pete’s family took care of us in just that manner, as family. This renovation will allow others to be greeted first by the beauty outdoors, but the true beauty lies in the community and the message inside. All ARE welcome! Regarding the parking lots, the one facing Point Loma Ave. on the ocean side of the alley was much wider in the middle than it needed to be, and had a lot of space that could not be used for parking. The width has now been reduced and plants have sprung up along the side closest to the church and Parish Hall. Only a couple of spaces were lost due to an entry “bump out.” Geoff, you need to go down there to take a look before being worried any more. The in-fill building two store fronts up the street wiped out way more asphalt than this project, and besides, the church lot is most heavily used Sunday mornings or evenings for events when some of the other businesses are closed. Note, bike racks were also added to encourage alternatives to driving. 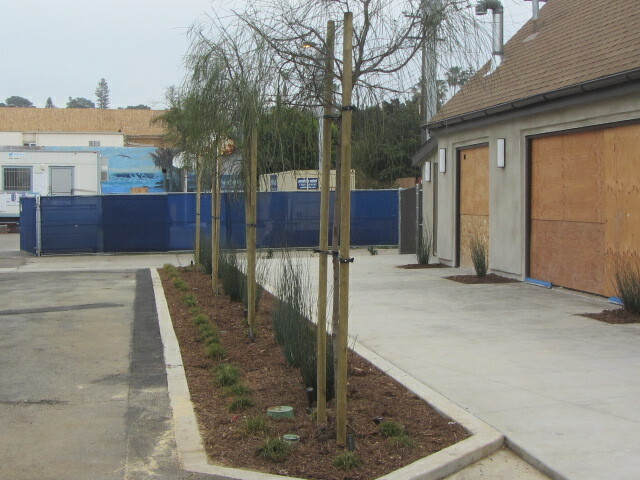 All of the landscaping looks fabulous and the new plants will use a lot less water than the dead or dying lawn that was on part of the lot before. It is a beautiful upgrade to the corner! Thanks for the great article! I am not a member of St Peters Church- or any Church for that matter. That being said, my 2 daughters go to the St Peters Pre-School and I have been doing drop off and pickup pretty much every weekday throughout the construction process. With my wife (who happens to be a Civil Engineer/Construction Manager) on the Pre-School committee, we have been asking tough questions during the entire renovation with St Peters and the on-site Construction Manager at Watkins (the contractor) such as: Asbestos removal, potential old issues, noise, fumes, etc- we asked. If you want to talk to someone who has dealt with concerns and frustrations over this renovation- I would be a pretty good source. While I have not been there for Sunday Services, I am by there on Sunday Mornings when there are services and have gone to many “Packed House” events in the Sanctuary and the Parish Hall. There has always been ample parking in the lots during these events. IMHO- The “loss” of 3 spaces is inconsequential to the surrounding community during peak use. If there are parking issues on Point Loma Avenue- look across the street at the Apartment buildings with inadequate planning and the other businesses such as the former Ranchos site with no off street parking- those are the issues, not St Peters. Pastor Marohn and every staff member at St Peters are positively beaming with pride and relief as this project approaches it’s conclusion- and rightfully so. The results are beautiful- inside and out. IMHO- St Peters has more parking and a better facility than any other Church in OB. They are an asset to our community. Check out what they have done at their open house. I think you will be impressed and proud to have them as a neighbor. Just so everyone is clear, I don’t look at any project based on its usage, I look at all of them the same whether they are churches, restaurants, or apartment buildings. I am not one to give churches a pass just because they are a sacred, unassailable thing like cycling or native plants have become. Churches have to abide by the same building rules that everyone else does. Usually, if on-site parking is removed, it has to be replaced elsewhere on a property. I don’t care if there is supposedly adequate parking on the street, street parking does not count in the parking requirements of a project. Now, if the existing parking the church still has meets or exceeds the requirements for the usage, a church, then the point is moot. All these other comments show that people like this church and that is great but those comments didn’t answer the question. I don’t know what the parking requirements are, but I do know they have more parking than any other Church in OB- including The Epicopal Church at Brighton and SSC that knocked down the super cute bungalow I used to rent from them to put in a parking lot. Whenever a remodeling project is done, the owner has to bring some things up to current codes and standards. I don’t remember for sure if this is the same church, but it seems to me they had a lot they expanded into and they may have had to create new parking by taking down the cottage. Many buildings, including too many apartments, were allowed to be constructed for years with little or no parking requirements. This is why parking requirements came into being. I’m sure that many of the churches fall into this category because most of them have been around for a long time. This church does have a lot of parking but removal of parking spaces – unless they were already over the code requirement – would require a permit and a design that replace the spots elsewhere. That was all I asked. Most people would look at google maps first btw; your concern is one shared by all, and is 100% warranted as a fair question, esp for most construction projects. How often have we seen parking adequate for one or two, suddenly get the pass that it can magically support 6 or 10? That is not ok, but as you say, happens far too often. If you are truly concerned, you really will need to see for yourself! So go for a walk, take a look, and report back on what you see!